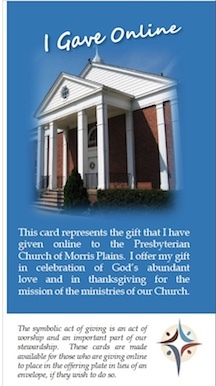 Thank you for your interest in supporting the Presbyterian Church of Morris Plains. We offer many secure options for you to set up a one-time or recurring contribution from your debit card, credit card, or direct bank transfer. First time users will need to setup an account so we can credit you for your charitable contributions. We offer giving through a secure website or via text-messaging from your cell phone, and you can choose from a variety of funds to support such as missions, our bell choirs, or our youth programs. You pay nothing for this service; the church pays the bank fees. If you'd like to understand the fees, you can try our calculator. Donations and record keeping are hosted by the professionals from our contractor, Breeze Church Management Systems. Your personal banking information is kept secure by the same company that is used by Amazon, Lyft, and other large corporations. No one at the church or even at Breeze has any access to your bank information.